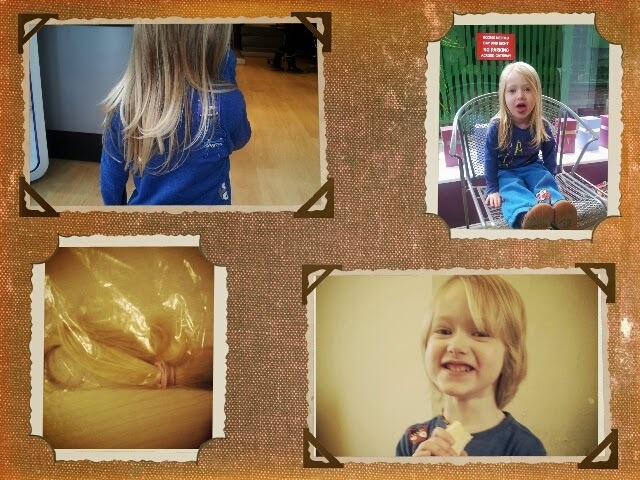 At the grand old age of three years, nine and a half months The Toddler has had his first ever haircut, yes.... his beautiful golden mane is gone. There was must rejoicing from The Husband and The Mother who've been campaigning for quite some time for him to lose the locks. Evidently, despite The Toddlers gender confidence, others weren't so confident and were bothered on his behalf. However, I stood my ground and refused to give in to a complete crop. I'll give him his dues, The Toddler was miraculously unperturbed by the whole event as some stranger in an unfamiliar environment went at his hair with scissors, unlike I who was swallowing copious amounts of rampant hormones and trying not to weep. The only inkling of a reaction he displayed was being somewhat pissed off every time some rogue hairs landed on the screen of The Husbands phone which he'd been allowed to play upon. If only the changes for my sweet boy ended there yet alas this year will be full of unstoppable necessities that feel as if they're steam rollering over us. Last week saw him receiving his MMR, something we delay with The Spawn until they're over 3.5 yrs of age and yet again something he remarkably took in his stride with an indignant 'ouch!' and a mere second of a wibble. When did my tiny get so grown up and brave? That leads us to this week, the start of Nursery. Although eligible for five sessions a week we're only sending him two, again this is how we did it with Things One and Two. Obviously if he asks he will go more. This will be a totally alien situation to him. If only the changes stopped there..... later this year he'll be moving out of my room and co-sleeping and into a room with Thing Two and be totally weaned. End of August he'll become a Big Brother and come September he'll be in full time school. Such a big year for my tiny boy.